Many of us are surprised to find about a hidden problem we have in our cars. That problem is your car’s cabin air quality. Mold, mildew and bacteria are a growing concern in many vehicles’ ventilation systems. The dark and damp ventilation units are a perfect breeding ground for microorganisms that can be potentially harmful to your health. 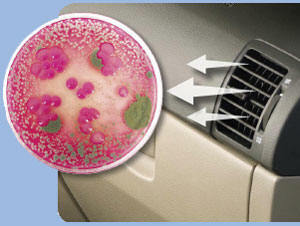 The result is a mix of mold, mildew and bacteria blown into the passenger compartment every time the fan is turned on. Fortunately, we now have a solution for you. Camarillo Car Care now has a solution for this growing concern. We researched and discovered a recently developed piece of equipment that effectively treats your vehicle’s ventilation system. This equipment was named product of the year in 2006 by Popular Mechanics. With this equipment, we now can offer the “Ventilation System Service.” It only takes an additional 20-30 minutes while your car is in for service. The technician seals the car and starts the process of treating the ventilation system. The result is a healthy solution that restores interior air quality, and effectively treats mold, mildew and bacteria as well as eliminating offensive odors.